(Second or third viewing, On DVD, September 2017) I’ve been on a semi-streak of American space program movies lately and revisiting The Right Stuff was practically mandatory as a bookend to Apollo 13. Adapting Tom Wolfe’s superlative docufiction book, writer/director Philip Kaufman’s film is epic in length (nearly three hours) and clearly in myth-making mode as it draws a line leading from cowboys to astronauts by way of test pilots. It’s a long sit, but it’s filled with great moments, enlivened by a surprising amount of humour and a joy to watch from beginning to end. It helps that it can depend on great performances, whether it’s Ed Harris as a clean-cut John Glenn to Fred Ward as Gus Grissom, among many other known actors in small roles. It’s an astonishing ensemble cast for a wide-spectrum film, though, and it manages to compress quite a bit of material in even its unusually long running time. As a homage to the space program, it remains a point of reference—even the special effects are still credible. Despite a generous amount of dramatic licence (including the infamous Liberty Bell 7 incident, now thoroughly debunked thanks to the 1999 recovery of the capsule), the film seems generally well regarded when it comes to historical accuracy. From our perspective, it credibly humanizes yet mythologizes the test pilots who were crazy enough to go atop rockets when they were known to explode shortly after launch. It’s a stirring bit of filmmaking for viewers with a fascination for technological topics and the history of spaceflight, and it has aged rather gracefully. I loved the movie when I first saw it (in French, on regular TV interspaced between ads) and I still love it now. 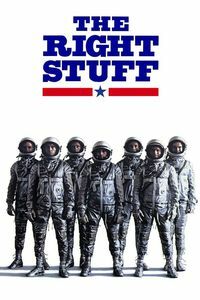 As suggested above, The Right Stuff is an essential double feature with Apollo 13, and both movies even feature Ed Harris in pivotal roles. (On Cable TV, August 2013) I like to think that I’ve got a pretty good mental encyclopedia of fantasy movies, but this one had completely eluded me until now: A made-for-HBO film taking place in late-1940s Los Angeles in which magic is real and a gumshoe works at preventing a monstrous apocalypse. Fred Ward stars as the tough-guy private detective (named Philip Lovecraft, ha), and he gets a few crunchy lines in-between his narration and his one-liners. Cast a Deadly Spell gamely tries to portray a suddenly-magical Los Angeles and blend it with noir aesthetics, but it’s hampered by a low budget and by a lack of internal consistency: it’s never too clear how magic is supposed to work, as the various fantastical elements blend together in a blur of self-contradictory events. Still, the film works relatively well as an unassuming hidden gem, and if the final gag can be seen well in advance, it’s still good for a laugh or two. Director Martin Campbell and femme-fatale Julianne Moore would go on to bigger and better films a few years later. 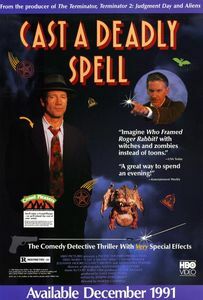 Cast a Deadly Spell was followed by the barely-related Witch Hunt in 1994.